Put the Windows CD into CD drive. Then let the PC boot fully and open the home page of Windows setup. In last it is upon you whether you in install the new window by deleting the one which you already have or installing the new one on new partition. 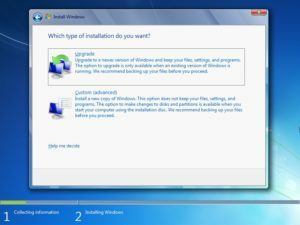 Now we come to our topic; windows 7 upgrade clean install with upgrade media means we have to perform clean installation of windows 7 by using the upgrade version. In this case we aren’t using full version because it is too expensive and upgrade versions are far more common than full versions. Before learning the methods I want to tell you some tips and tricks from which people were unaware back in 2009 when window 7 was shipped all over the world. If you are using Windows Vista or Windows XP then, whenever you will launch windows 7 setup from your existing old OS, you will be able to run windows 7 actively. While installation of Windows 7 recovery partitions don’t count. These recovery partitions are used for compliance checking. Windows 7 do it compliance checking before the setup phase where you format the disc. To make windows 7 active quickly just call the free Microsoft help line. First insert the Windows 7 Upgrade DVD in your PC’s optical disc. As usual reboot the computer, let the DVD boot runs and then follow the simple steps to install windows 7. Note: If you have already an OS in in your PC than backup your data before moving further. After Windows 7 is installed, you will be taken to desktop. Next, go to Windows update centre and perform all the updates which are available. After all updates type “activate” in start menu search to open the Activate windows utility. Type in your key and enter. You are done! If this method doesn’t work then don’t be upset start working on method # 2 or contact Microsoft support. This method assures success but it is not encouraged to the people who are not confident. Any mistake may lead to further complications. Now change media boost install from “1” to “0” and close RegEdit.exe. Now in the command line window type; slmgr /rearm, tap enter and wait for command complete. Now close the command window and restart the PC, when you are back on desktop, open windows activate utility and enter your product key… You are done! Note: In both methods it is essential to not leave any update. The above methods will work for anyone who can correctly follow the instructions. If you are legal owner of your previously installed windows then you can directly contact Microsoft. Method 1 ( windows 7 upgrade clean install) is more preferred but both can give the required output. So the choice of method is totally yours.